The Cooley–Tukey algorithm, named after J.W. Cooley and John Tukey, is the most common fast Fourier transform (FFT) algorithm. It re-expresses the discrete Fourier transform (DFT) of an arbitrary composite size N = N1N2 in terms of N1 smaller DFTs of sizes N2, recursively, to reduce the computation time to O(N log N) for highly composite N (smooth numbers). Because of the algorithm's importance, specific variants and implementation styles have become known by their own names, as described below. Because the Cooley-Tukey algorithm breaks the DFT into smaller DFTs, it can be combined arbitrarily with any other algorithm for the DFT. For example, Rader's or Bluestein's algorithm can be used to handle large prime factors that cannot be decomposed by Cooley–Tukey, or the prime-factor algorithm can be exploited for greater efficiency in separating out relatively prime factors. The algorithm, along with its recursive application, was invented by Carl Friedrich Gauss. Cooley and Tukey independently rediscovered and popularized it 160 years later. This algorithm, including its recursive application, was invented around 1805 by Carl Friedrich Gauss, who used it to interpolate the trajectories of the asteroids Pallas and Juno, but his work was not widely recognized (being published only posthumously and in neo-Latin). Gauss did not analyze the asymptotic computational time, however. Various limited forms were also rediscovered several times throughout the 19th and early 20th centuries. FFTs became popular after James Cooley of IBM and John Tukey of Princeton published a paper in 1965 reinventing the algorithm and describing how to perform it conveniently on a computer. Tukey reportedly came up with the idea during a meeting of President Kennedy’s Science Advisory Committee discussing ways to detect nuclear-weapon tests in the Soviet Union by employing seismometers located outside the country. These sensors would generate seismological time series. However, analysis of this data would require fast algorithms for computing DFT due to number of sensors and length of time. This task was critical for the ratification of the proposed nuclear test ban so that any violations could be detected without need to visit Soviet facilities. Another participant at that meeting, Richard Garwin of IBM, recognized the potential of the method and put Tukey in touch with Cooley however making sure that Cooley did not know the original purpose. Instead Cooley was told that this was needed to determine periodicities of the spin orientations in a 3-D crystal of Helium-3. Cooley and Tukey subsequently published their joint paper, and wide adoption quickly followed due to the simultaneous development of Analog-to-digital converters capable of sampling at rates up to 300 kHz. The fact that Gauss had described the same algorithm (albeit without analyzing its asymptotic cost) was not realized until several years after Cooley and Tukey's 1965 paper. Their paper cited as inspiration only the work by I. J. Good on what is now called the prime-factor FFT algorithm (PFA); although Good's algorithm was initially thought to be equivalent to the Cooley–Tukey algorithm, it was quickly realized that PFA is a quite different algorithm (only working for sizes that have relatively prime factors and relying on the Chinese Remainder Theorem, unlike the support for any composite size in Cooley–Tukey). A radix-2 decimation-in-time (DIT) FFT is the simplest and most common form of the Cooley–Tukey algorithm, although highly optimized Cooley–Tukey implementations typically use other forms of the algorithm as described below. Radix-2 DIT divides a DFT of size N into two interleaved DFTs (hence the name "radix-2") of size N/2 with each recursive stage. where is an integer ranging from to . Radix-2 DIT first computes the DFTs of the even-indexed inputs and of the odd-indexed inputs , and then combines those two results to produce the DFT of the whole sequence. This idea can then be performed recursively to reduce the overall runtime to O(N log N). This simplified form assumes that N is a power of two; since the number of sample points N can usually be chosen freely by the application, this is often not an important restriction. This result, expressing the DFT of length N recursively in terms of two DFTs of size N/2, is the core of the radix-2 DIT fast Fourier transform. The algorithm gains its speed by re-using the results of intermediate computations to compute multiple DFT outputs. Note that final outputs are obtained by a +/− combination of and , which is simply a size-2 DFT (sometimes called a butterfly in this context); when this is generalized to larger radices below, the size-2 DFT is replaced by a larger DFT (which itself can be evaluated with an FFT). 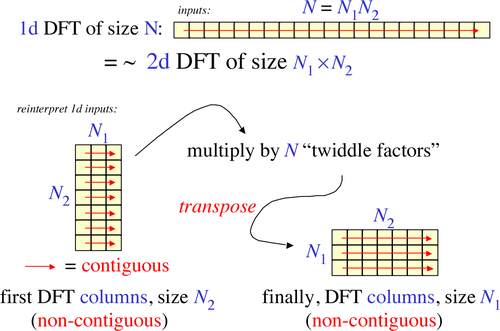 Data flow diagram for N=8: a decimation-in-time radix-2 FFT breaks a length-N DFT into two length-N/2 DFTs followed by a combining stage consisting of many size-2 DFTs called "butterfly" operations (so-called because of the shape of the data-flow diagrams). This process is an example of the general technique of divide and conquer algorithms; in many traditional implementations, however, the explicit recursion is avoided, and instead one traverses the computational tree in breadth-first fashion. Here, ditfft2(x,N,1), computes X=DFT(x) out-of-place by a radix-2 DIT FFT, where N is an integer power of 2 and s=1 is the stride of the input x array. x+s denotes the array starting with xs. High-performance FFT implementations make many modifications to the implementation of such an algorithm compared to this simple pseudocode. For example, one can use a larger base case than N=1 to amortize the overhead of recursion, the twiddle factors can be precomputed, and larger radices are often used for cache reasons; these and other optimizations together can improve the performance by an order of magnitude or more. (In many textbook implementations the depth-first recursion is eliminated entirely in favor of a nonrecursive breadth-first approach, although depth-first recursion has been argued to have better memory locality.) Several of these ideas are described in further detail below. The basic step of the Cooley–Tukey FFT for general factorizations can be viewed as re-interpreting a 1d DFT as something like a 2d DFT. The 1d input array of length N = N1N2 is reinterpreted as a 2d N1×N2 matrix stored in column-major order. One performs smaller 1d DFTs along the N2 direction (the non-contiguous direction), then multiplies by phase factors (twiddle factors), and finally performs 1d DFTs along the N1 direction. The transposition step can be performed in the middle, as shown here, or at the beginning or end. This is done recursively for the smaller transforms. Perform N1 DFTs of size N2. Multiply by complex roots of unity called twiddle factors. Perform N2 DFTs of size N1. There are many other variations on the Cooley–Tukey algorithm. Mixed-radix implementations handle composite sizes with a variety of (typically small) factors in addition to two, usually (but not always) employing the O(N2) algorithm for the prime base cases of the recursion (it is also possible to employ an N log N algorithm for the prime base cases, such as Rader's or Bluestein's algorithm). Split radix merges radices 2 and 4, exploiting the fact that the first transform of radix 2 requires no twiddle factor, in order to achieve what was long the lowest known arithmetic operation count for power-of-two sizes, although recent variations achieve an even lower count. (On present-day computers, performance is determined more by cache and CPU pipeline considerations than by strict operation counts; well-optimized FFT implementations often employ larger radices and/or hard-coded base-case transforms of significant size.) Another way of looking at the Cooley–Tukey algorithm is that it re-expresses a size N one-dimensional DFT as an N1 by N2 two-dimensional DFT (plus twiddles), where the output matrix is transposed. The net result of all of these transpositions, for a radix-2 algorithm, corresponds to a bit reversal of the input (DIF) or output (DIT) indices. If, instead of using a small radix, one employs a radix of roughly √N and explicit input/output matrix transpositions, it is called a four-step algorithm (or six-step, depending on the number of transpositions), initially proposed to improve memory locality, e.g. for cache optimization or out-of-core operation, and was later shown to be an optimal cache-oblivious algorithm. where each inner sum is a DFT of size N2, each outer sum is a DFT of size N1, and the [...] bracketed term is the twiddle factor. An arbitrary radix r (as well as mixed radices) can be employed, as was shown by both Cooley and Tukey as well as Gauss (who gave examples of radix-3 and radix-6 steps). Cooley and Tukey originally assumed that the radix butterfly required O(r2) work and hence reckoned the complexity for a radix r to be O(r2 N/r logrN) = O(N log2(N) r/log2r); from calculation of values of r/log2r for integer values of r from 2 to 12 the optimal radix is found to be 3 (the closest integer to e, which minimizes r/log2r). This analysis was erroneous, however: the radix-butterfly is also a DFT and can be performed via an FFT algorithm in O(r log r) operations, hence the radix r actually cancels in the complexity O(r log(r) N/r logrN), and the optimal r is determined by more complicated considerations. In practice, quite large r (32 or 64) are important in order to effectively exploit e.g. the large number of processor registers on modern processors, and even an unbounded radix r=√N also achieves O(N log N) complexity and has theoretical and practical advantages for large N as mentioned above. Although the abstract Cooley–Tukey factorization of the DFT, above, applies in some form to all implementations of the algorithm, much greater diversity exists in the techniques for ordering and accessing the data at each stage of the FFT. Of special interest is the problem of devising an in-place algorithm that overwrites its input with its output data using only O(1) auxiliary storage. The most well-known reordering technique involves explicit bit reversal for in-place radix-2 algorithms. Bit reversal is the permutation where the data at an index n, written in binary with digits b4b3b2b1b0 (e.g. 5 digits for N=32 inputs), is transferred to the index with reversed digits b0b1b2b3b4 . Consider the last stage of a radix-2 DIT algorithm like the one presented above, where the output is written in-place over the input: when and are combined with a size-2 DFT, those two values are overwritten by the outputs. However, the two output values should go in the first and second halves of the output array, corresponding to the most significant bit b4 (for N=32); whereas the two inputs and are interleaved in the even and odd elements, corresponding to the least significant bit b0. Thus, in order to get the output in the correct place, b0 should take the place of b4 and the index becomes b0b4b3b2b1. And for next recursive stage, those 4 least significant bits will become b1b4b3b2, If you include all of the recursive stages of a radix-2 DIT algorithm, all the bits must be reversed and thus one must pre-process the input (or post-process the output) with a bit reversal to get in-order output. (If each size-N/2 subtransform is to operate on contiguous data, the DIT input is pre-processed by bit-reversal.) Correspondingly, if you perform all of the steps in reverse order, you obtain a radix-2 DIF algorithm with bit reversal in post-processing (or pre-processing, respectively). Alternatively, some applications (such as convolution) work equally well on bit-reversed data, so one can perform forward transforms, processing, and then inverse transforms all without bit reversal to produce final results in the natural order. Many FFT users, however, prefer natural-order outputs, and a separate, explicit bit-reversal stage can have a non-negligible impact on the computation time, even though bit reversal can be done in O(N) time and has been the subject of much research. Also, while the permutation is a bit reversal in the radix-2 case, it is more generally an arbitrary (mixed-base) digit reversal for the mixed-radix case, and the permutation algorithms become more complicated to implement. Moreover, it is desirable on many hardware architectures to re-order intermediate stages of the FFT algorithm so that they operate on consecutive (or at least more localized) data elements. To these ends, a number of alternative implementation schemes have been devised for the Cooley–Tukey algorithm that do not require separate bit reversal and/or involve additional permutations at intermediate stages. The problem is greatly simplified if it is out-of-place: the output array is distinct from the input array or, equivalently, an equal-size auxiliary array is available. 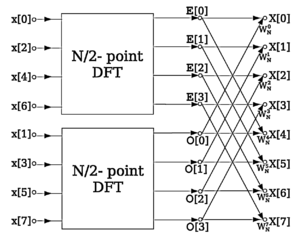 The Stockham auto-sort algorithm performs every stage of the FFT out-of-place, typically writing back and forth between two arrays, transposing one "digit" of the indices with each stage, and has been especially popular on SIMD architectures. Even greater potential SIMD advantages (more consecutive accesses) have been proposed for the Pease algorithm, which also reorders out-of-place with each stage, but this method requires separate bit/digit reversal and O(N log N) storage. One can also directly apply the Cooley–Tukey factorization definition with explicit (depth-first) recursion and small radices, which produces natural-order out-of-place output with no separate permutation step (as in the pseudocode above) and can be argued to have cache-oblivious locality benefits on systems with hierarchical memory. A typical strategy for in-place algorithms without auxiliary storage and without separate digit-reversal passes involves small matrix transpositions (which swap individual pairs of digits) at intermediate stages, which can be combined with the radix butterflies to reduce the number of passes over the data. 1 2 3 4 5 Cooley, James W.; Tukey, John W. (1965). "An algorithm for the machine calculation of complex Fourier series". Math. Comput. 19: 297–301. doi:10.2307/2003354. ↑ Cooley, James W.; Lewis, Peter A. W.; Welch, Peter D. (1967). "Historical notes on the fast Fourier transform". IEEE Trans. on Audio and Electroacoustics. 15 (2): 76–79. doi:10.1109/tau.1967.1161903. ↑ Rockmore, Daniel N. , Comput. Sci. Eng. 2 (1), 60 (2000). The FFT — an algorithm the whole family can use Special issue on "top ten algorithms of the century " "Archived copy" (PDF). Archived from the original (PDF) on 2009-04-07. Retrieved 2009-03-31. ↑ James W. Cooley, Peter A. W. Lewis, and Peter W. Welch, "Historical notes on the fast Fourier transform," Proc. IEEE, vol. 55 (no. 10), p. 1675–1677 (1967). ↑ Danielson, G. C., and C. Lanczos, "Some improvements in practical Fourier analysis and their application to X-ray scattering from liquids," J. Franklin Inst. 233, 365–380 and 435–452 (1942). 1 2 3 S. G. Johnson and M. Frigo, "Implementing FFTs in practice," in Fast Fourier Transforms (C. S. Burrus, ed. ), ch. 11, Rice University, Houston TX: Connexions, September 2008. 1 2 Singleton, Richard C. (1967). "On computing the fast Fourier transform". Commun. of the ACM. 10 (10): 647–654. doi:10.1145/363717.363771. ↑ Lundy, T., and J. Van Buskirk, "A new matrix approach to real FFTs and convolutions of length 2k," Computing 80, 23-45 (2007). ↑ Johnson, S. G., and M. Frigo, "A modified split-radix FFT with fewer arithmetic operations," IEEE Trans. Signal Processing 55 (1), 111–119 (2007). 1 2 3 4 5 Frigo, M.; Johnson, S. G. (2005). "The Design and Implementation of FFTW3" (PDF). Proceedings of the IEEE. 93 (2): 216–231. doi:10.1109/JPROC.2004.840301. 1 2 Gentleman W. M., and G. Sande, "Fast Fourier transforms—for fun and profit," Proc. AFIPS 29, 563–578 (1966). 1 2 M. Frigo, C.E. Leiserson, H. Prokop, and S. Ramachandran. Cache-oblivious algorithms. In Proceedings of the 40th IEEE Symposium on Foundations of Computer Science (FOCS 99), p.285-297. 1999. Extended abstract at IEEE, at Citeseer. ↑ Karp, Alan H. (1996). "Bit reversal on uniprocessors". SIAM Review. 38 (1): 1–26. doi:10.1137/1038001. JSTOR 2132972. ↑ Carter, Larry; Gatlin, Kang Su (1998). "Towards an optimal bit-reversal permutation program". Proc. 39th Ann. Symp. on Found. of Comp. Sci. (FOCS): 544–553. doi:10.1109/SFCS.1998.743505. ↑ Rubio, M.; Gómez, P.; Drouiche, K. (2002). "A new superfast bit reversal algorithm". Intl. J. Adaptive Control and Signal Processing. 16 (10): 703–707. doi:10.1002/acs.718. ↑ Originally attributed to Stockham in W. T. Cochran et al., What is the fast Fourier transform?, Proc. IEEE vol. 55, 1664–1674 (1967). 1 2 P. N. Swarztrauber, FFT algorithms for vector computers, Parallel Computing vol. 1, 45–63 (1984). ↑ Swarztrauber, P. N. (1982). "Vectorizing the FFTs". In Rodrigue, G. Parallel Computations. New York: Academic Press. pp. 51–83. ISBN 0-12-592101-2. ↑ Pease, M. C. (1968). "An adaptation of the fast Fourier transform for parallel processing". J. ACM. 15 (2): 252–264. doi:10.1145/321450.321457. ↑ Johnson, H. W.; Burrus, C. S. (1984). "An in-place in-order radix-2 FFT". Proc. ICASSP: 28A.2.1–28A.2.4. ↑ Temperton, C. (1991). "Self-sorting in-place fast Fourier transform". SIAM Journal on Scientific and Statistical Computing. 12 (4): 808–823. doi:10.1137/0912043. ↑ Qian, Z.; Lu, C.; An, M.; Tolimieri, R. (1994). "Self-sorting in-place FFT algorithm with minimum working space". IEEE Trans. ASSP. 52 (10): 2835–2836. doi:10.1109/78.324749. ↑ Hegland, M. (1994). "A self-sorting in-place fast Fourier transform algorithm suitable for vector and parallel processing". Numerische Mathematik. 68 (4): 507–547. doi:10.1007/s002110050074. a simple, pedagogical radix-2 Cooley–Tukey FFT algorithm in C++.